First person shooters have this reputation of being nothing but frenetic respawn fests, filled with young abusive kids who don’t have the attention span for anything at a slower pace. Call of Duty (the modern generation) has a lot to answer for in this regard, and with its focus on tighter maps, faster respawns, and more realistic player damage, the multiplayer element of the game became less about tactics and more about a fast-paced run to your death or accidentally bumping in to a target and taking them down. With things like defending or “camping” decried as unfair and “noobish”. I don’t like those types of games. I like to take my time; I like to plan and have a strategy before making a move. So back last year when Rainbow Six Siege was announced at E3 I was, unsurprisingly, quite excited. The intensity to be had from joining a group of friends, planning and executing an attack on a fortified building populated by players who are trying to anticipate your moves, before breaching and clearing through entirely destructible environments is exactly why I game. It’s the only place to get those kinds of experiences, short of joining the army or the FBI. Now, obviously that E3 presentation was staged as hell, as trying to get a group of people to coordinate like that is damn near impossible, but the idea, well the idea was exciting. 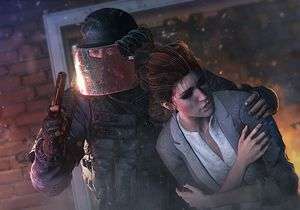 Roll on December 2015, and after a few incredibly buggy beta runs, Rainbow Six Siege is launched by Ubisoft on PS4, Xbox One, and PC. 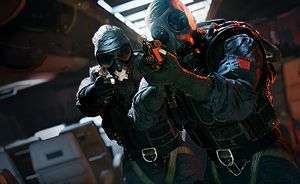 Siege is a multiplayer-focused FPS that puts players in the boots (or trainers) of a member of the elite multi-national counter terrorism team, Rainbow Six. Players start with just a basic character, who in the UI looks like a drafted soldier from Metal Gear Solid’s Mother Base, but after a few missions can unlock operators who bring their own unique skills to each fight. The game is essentially a series of single and multiplayer modes, much like EA’s recent Star Wars: Battlefront. Situations are the focus of the game’s single player effort and work as both a tutorial and a fairly easy way to gain some of the in-game currency – renown. Each of the missions has a particular focus, such as clearing an aircraft of enemies or rescuing a hostage from a fortified suburban home. They each have a range of secondary objectives that award renown, which are typically tied to the mechanic the game is trying to teach you. While fun and a great introduction, the missions get a little difficult towards the end, and the AI in general isn’t too bright, either randomly chasing you through the map, or shooting you from extreme distances while looking in the opposite direction. In fact in one mission I found a couple of AI terrorists standing in the middle of the street randomly firing into the side of a building. This can be a particular problem in the Terrorist Hunt game mode, which pits one squad of human players against a large group of AI combatants. Players try to complete one of the main objectives, rescue a hostage, defuse two bombs, or capture a point while fending off waves of AI opponents. It can be pretty challenging as your team finds itself vastly outnumbered and supplies begin to dwindle. Where the game mode really shines, however, is during bomb disposal where players first find themselves attacking a building in order to locate the device and plant a defuser, and then switch to defence as large numbers of terrorists swarm the area trying to stop them. These terrorist units vary in type, from the basic soldier and the self-immolating bomber to shield carrying units. They will breach walls and attack rooms from various angles, dropping flashbangs and other grenades, making the challenge real to players, but on normal difficulty they don’t hit very hard and go down without much of a fight. Terrorist Hunt works well and, despite the AI difficulties, is a great addition to the game, but the standard multiplayer mode is where this game comes in to its own. Essentially this mode works like Terrorist Hunt but focuses on two teams of five human players attacking and defending an objective. Each round starts with players selecting their character, either the basic rookie, who can be customised with a variety of weapons and equipment, or one of the operators. Operators come in one of two flavours – Attack or Defence – and have skills that are tied to this. 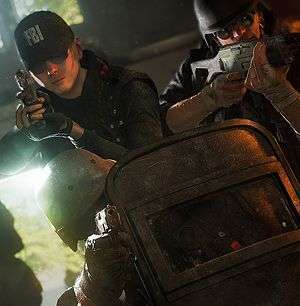 Fuse, for example, is an attack operator from the FBI and, as his name might suggest, is used generally to melt down reinforced walls using his Thermite breaching charge. Rook, on the other hand, is a defensive operator who provides a boost to the health of his team mates through the deployment of a bag of armour plates. Attackers begin a round by deploying small two-wheeled drones which shoot off in the direction of the target building with the aim of identifying the position of the enemy or the objective. While this is happening, defending players fortify their positions, placing traps on doorframes, barricading windows and doors, or generally finding a decent ambush position. This thirty seconds or so of frantic action really sets the tone for the whole round (and, in a sense, the wider game) as players have to communicate and coordinate if they want to win. Sadly, however, more often than not (unless you have some actual friends) you will be playing with random players, who often don’t have their mic turned on and don’t really care about planning anyway, leading to games where people just run off and do their own thing. Once the planning phase is complete, attackers make their way to the objective, if they have located it, while the defenders wait in their ambush positions or continue to quickly fortify. One impressive feature is the defenders’ ability to look through external cameras, tagging enemies, and tracking their movements. A professional team of attackers will know to disable all of the cameras as they move, preferably with a silenced weapon so they don’t give away their position, but more often than not an attacker will be spotted and flagged, giving the defenders a fair idea of where an attack will be coming from. This support also extends after a defender is killed, switching to camera mode and supporting his or her team from beyond the grave by using the cameras to tag targets. More than once I’ve seen a defending team turn the game around with this support and it is a brilliant way of keeping players engaged after they are out of the fight. Attackers get a similar option, switching back to their drones, which can’t be moved but work just like cameras. Matches invariably boil down to one group taking out the other group, rather than completing any objectives, but generally the destructible environments, the addition of tagging, repelling, and breaching all make for a pretty varied and intense experience. The environments, ten maps worth at release, are beautifully put together and incredibly varied. From the LA bank to the snowy Chateaux, each map is richly detailed, with various objective points giving at least some kind of variety to the overall gameplay. Ubisoft Montreal have included a unique system for texturing terrain which is layered and provides a more realistic look when you are blasting through those plasterboard walls. The use of atmospheric particle effects is also brilliantly done within the game, although obviously to a lesser degree on the consoles. There is a particular section on the bank map where corridors are filled with sprinkler-system rain and smoke from leaking pipes, which not only adds to the atmosphere but allows players to hide and advance, adding a tactical layer to the gameplay. All of this adds a sense of realism to gameplay, and everything has that lovely visceral feeling to it. Ubisoft have done a great job with Rainbow Six Siege. While there are some issues with the AI, the core gameplay – the 5 vs 5 multiplayer – works incredibly well. Despite the beta issues with servers and the match-making system, they have somehow pulled off a fairly flawless launch. While there won’t be enough here if you are more of a lone wolf, if you enjoy tactical first person shooter combat then you should enjoy Rainbow Six Siege. I repelled through a window and shot a guy in the face! Siege is a brilliant take on the FPS; it’s refreshing and a change of pace when compared to anything else on the market, especially on console. Planning an attack with your friends and executing it with military proficiency, while rare, is something you find yourselves talking or laughing about for a long time afterwards. Equally, fortifying a position and putting up an effective defence is just as rewarding to me. This is the kind of game that I love. There are concerns however, and, much like Battlefront, I worry about the lack of maps. Yes, ten in Vanilla, but how quickly will players drop off if the game isn’t backed up with some half decent DLC? Is there enough here to keep players engaged for anything more than a few weeks? I’m not sure, but that should be a real concern for players who will then find themselves stuck dealing with the pretty crappy AI when they can’t find any real players to game with. All of that is speculation, however, and I can only recommend Rainbow Six Siege. If you enjoy an FPS and are tired of the pace of Battlefield and Call of Duty, take a breath, and pull the trigger on purchasing Siege.